The SMTP commands VRFY and EXPN are commands which allow a client to verify (VRFY) and expand (EXPN) email addresses to check that they exist, and find out what they resolve to (eg for distribution groups & aliases). For security reasons they should usually be disabled, and the default configuration in VPOP3 is that they are disabled. However, in some situations they may be useful, for instance, third party software may use these commands to check that email addresses are valid. We recommend that you only enable these commands if you know they are going to be used legitimately, and that you restrict access to the commands as much as possible. 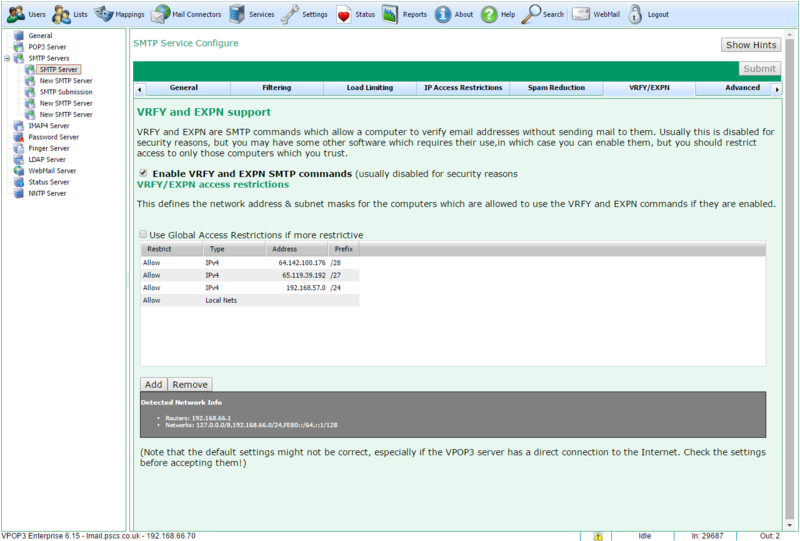 To enable the commands, check the box Enable VRFY and EXPN SMTP commands. To restrict which IP addresses can use the commands, use the access restrictions section on this page to indicate which computers can use the VRFY and EXPN commands.